"WOW. I cannot say enough good things about Grace (& Brandon)! It was SUCH A BLESSING to have Grace as both our engagement and wedding photographer. She went above and beyond to capture every beautiful moment and to make our wedding day run smoothly. She made the entire planning process A BREEZE - she was quick to respond to questions, to provide recommendations, and to help me create a smooth timeline for our day. Not only that, but she is SUCH A JOY to be around and made each photo shoot such a precious time - so much laughter and love!! Oh, and the actual photography? Her photos are OUT OF THIS WORLD and I will so treasure them! Not only that, but her turn-around time was crazy fast! Would recommend without a doubt, time and time again." "Grace is absolutely wonderful. Before my boyfriend and I met her in LA, she had been communicating with us about our ideas and visions. It was our first photo session as a couple so we just decided to leave it all in her hands. Let me tell you, she did not disappoint. She is meticulous and sharp- always two steps ahead of you. She pays attention to the littlest details. Details that I wouldn't even pay mind to. But all these little details are what make the photo. She has a way of authentically making the goofiest and purest sides of you surface while capturing them before you even realize she's taking your photo. Being in front of a camera can be nerve-racking, but she makes you feel comfortable. And her editing is flawless! And quick! You can tell that all of this comes so naturally to her. Above all else, Grace is kind, fun, and full of passion for sharing the love and joy exemplified by those she photographs. Her and her husband Brandon are two of the sweetest people we've met and we would absolutely choose them again and again. Thanks for a great experience, Grace! We will forever be swooning over our photos!" "We had a fantastic time with Grace as she photographed our wedding day! She went above and beyond to plan ahead of time, so that when the day came we felt comfortable and at ease. Her professionalism, positive attitude, and quirky sense of humor made for a fantastic experience. We are so pleased with our beautiful photos, cannot recommend her highly enough, and would hire her again in the future without hesitation." 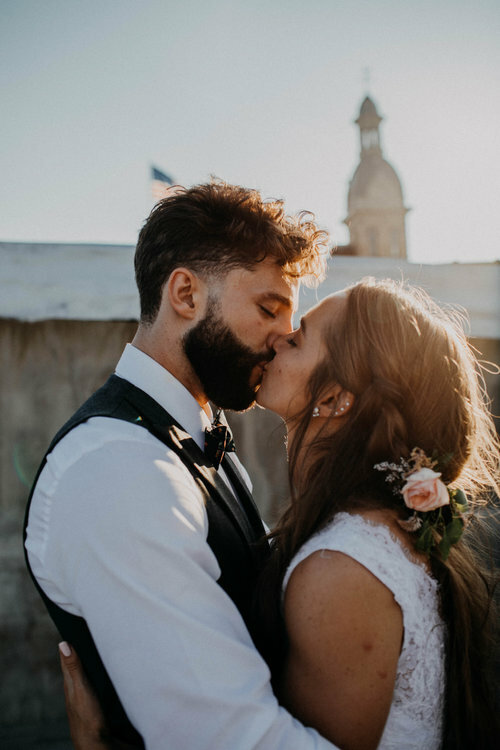 "Grace and Brandon were a DREAM to work with - Lawton and I were very picky when it came time to find a photographer, so we relied on the people who knew our style best. Our friends pointed us to Grace. Grace caught every perfect moment we wanted and even those we didn't know we would cherish so much. All of our guests were so amazed to see Grace and Brandon EVERYWHERE. Seriously, they were everywhere at all times! They captured so much and worked so diligently to make the day perfect. I thank my lucky stars to have found such a kind and amazing human, and I can't wait to see what our future holds -- I know I'll ask Grace to document it!" "Jordan and I had the best experience with Grace. She and Brandon did our wedding day, day after shoot, as well as their very FIRST wedding video and we couldn't be happier with how everything turned out! Her creativity and originality show through all of her work. We feel like our photos stand out from most wedding photography of today, which we love! Also, for our wedding video being the first they've made, it's truly amazing. We feel so blessed to be able to re-live that day over and over. For our day after shoot, we felt relaxed and were able to be ourselves because she made us feel comfortable. We had such a fun time! She was able to capture all the blissful and beautiful moments through her photography and videography for these shoots. We would recommend her to anyone and everyone. We feel very blessed and lucky to have these amazing moments captured forever by her." "Working with Grace on our wedding day was amazing. Not only are her photos beautiful, but she is also very professional and efficient. It's so important to feel comfortable with your photographer for such an intimate occasion, and we definitely felt that way with Grace. Wedding days can be chaotic, but she keeps things moving in a calm and collected way. She goes the extra mile with her editing and delivery of the images, adding a personal touch for every couple she works with. Lots of people can "document" the moments of your wedding day through photos, but Grace really turns those moments into art." "Grace is one of the most incredible photographers I know, and I’ve been following her work for awhile now. She BLEW MY MIND with how she captured me + my love! Hands down the best photos of Jake and I and I still gawk over them daily. She made us feel so comfortable to be ourselves and captured our personalities perfectly. Such a sweet, down-to-earth person, and we love her!" "Grace did an amazing job with our engagement photos in Joshua Tree National Park. She happily agreed to go the extra miles to photograph us in a place that is very near and dear to our hearts! We had a great and comfortable time during our session. Grace captured our little family (our dog was there too) perfectly and we couldn't be happier with the photos."